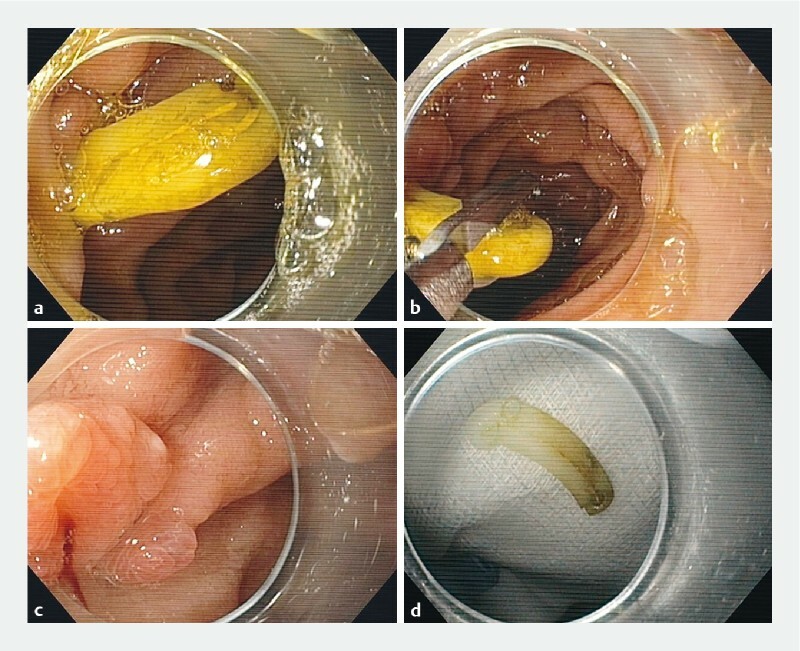 A 56-year-old woman with Peutz–Jeghers syndrome, who underwent a laparoscopic right hemicolectomy for colon adenocarcinoma 19 months earlier, presented for elective single-balloon antegrade enteroscopy to remove a 25 mm jejunal polyp previously identified on video capsule endoscopy. During duodenal intubation, a foreign body was found wedged into the wall of the second portion of the duodenum ([Fig. 1 a]). An attempt to gently pull the foreign body with grasping forceps was not successful. 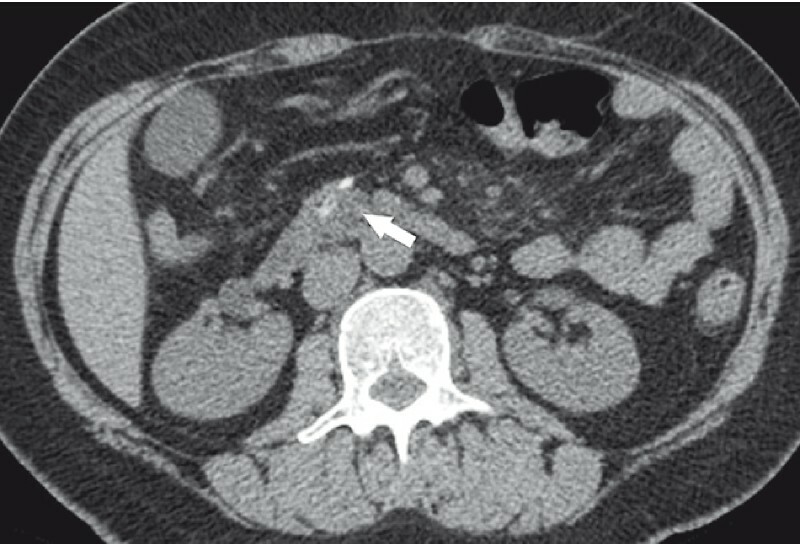 An abdominal computed tomography scan showed a moderately radiopaque foreign body (suggesting a bone), 20 mm in size, perforating the wall of the second duodenal portion to the retroperitoneum, with no associated inflammation, fluid collections or free air in the peritoneum ([Fig. 2]). Fig. 1 Foreign body removal – endoscopic view. a Foreign body wedged into the wall of the second portion of the duodenum. b Foreign body removal using grasping forceps. c Edematous duodenal mucosa at the site of the foreign body. d The foreign body was a Hem-o-Lok clip (Weck Closure Systems, Research Triangle Park, North Carolina, USA). Fig. 2 Abdominal computed tomography scan (axial view) showing a foreign body (arrow) located in the wall of the second duodenal portion. As the patient was asymptomatic, with normal vital signs and no systemic inflammation on blood tests, an elective upper endoscopy in the operating room with surgeon support was performed the following day ([Fig. 1 b – d]; [Video 1]). Through cap-assisted endoscopy, the foreign body was successfully retrieved using grasping forceps. Endoscopic review showed edematous duodenal mucosa with granulation tissue. Video 1 Foreign body retrieval using grasping forceps. On close inspection, the foreign body was a plastic clip. On review of the patient’s surgical notes, it was discovered that Hem-o-lok clips (Weck Closure Systems, Research Triangle Park, North Carolina, USA) had been used in the previous laparoscopic surgery for ileocolonic vessel ligation. The Hem-o-lok clip is a nonabsorbable polymer locking clip that is used frequently during laparoscopic procedures. Despite their well known safety , a few case reports of clip migration have been published    . The management of these cases remains controversial; both spontaneous detachment of these clips    and endoscopic removal  have been described. In our case, the patient was asymptomatic and the clip was found on routine upper endoscopy. Hem-o-lok clip retrieval was possible using grasping forceps, without complications. The patient was discharged 2 days later with proton pump inhibitors.